Us , quinquagenarian women have reached a point in our lives where work is simply not our priority. Time, on the other hand, has become a much more invaluable asset. Let’s be honest we want time to pursue our unfulfilled dreams, spent time with our loved ones and even to start a new chapter in our lives. Because I strongly believe in empowering our lives through our choices, I’ve come up with what I believe is an amazing article that hope you too would find helpful: Best jobs for women over 50. I narrowed them down to a 2 non-negotiable item criteria- number one being flexibility (working remotely, flexible schedule) and number two being time. After endless hours of research, I came across some very interesting jobs, which I believe to be awesome, and because sharing is caring I will pass my newly acquired knowledge down to you. So without further delay, I present you seven ideas that will allow you to increase your income, under YOUR own terms. If you’re confused about where to find a “flexible job”, a great website like indeed.com (any other one that we can add?) are a great place to start. A quick search with the term “online part time jobs” returned some interesting results, such as becoming an online personnal shopper or a social media moderator. This is a personal dream of mine, and thank to kind followers like you, I am living it. 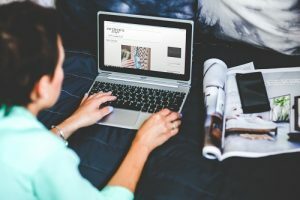 If you are fond of creating blogs and other essential posts in the online community, getting in touch with online blogging works is also an ideal way that you can from anywhere in the world- all you need is a laptop, a nice camera or a nice smartphone and internet connection. All you have to do is to contact blog owners to post blogs on their websites and agree on the way you monetize. An alternative is to create your own blog and put it out there. You’ll be amazed to find out how many people share your interests and hey you never know, it might be the beginning of a new career. Search engine companies like Google or Bing use algorithms for finding search queries. However they continuously need to monitor these queries for consistency on the search results .So this is where companies like Appen and Leapforce come in. They provide search engine companies with search engine evaluators (or even Social Media Evaluators), whose main task is to check the accuracy of the results provided by the search engines. The selection process include a few tests and some requirements, such as reliable high speed internet, and owning a smartphone. Glassdoor estimates their salaries to be around $13 per hour. Are you an expert in areas like Facebook marketing, have impeccable writing and presenting skills, speak a foreign language, or have great administrative skills? Then perhaps becoming an online administrative assistant is a right fit for you! Websites like Fiverr or Upwork are some of the places you can start searching. This is something that I see consistency within the top best jobs for women over 50. Not only is a great way to earn some serious bucks, but is very rewarding to mentor and enable others. This will be very cool for you if you are new mom/ or grandma! In this type of work, you test up and coming baby gadgets. Basically, the way it works is the company will send you a product sample, and you need to check everything about the product to assure that in your opinion these are healthy for babies. This is a highly paid job since today’s parents have so many options when it comes to products, so quality and safety for their little bundles of joy are a must. 6. Do small online tasks. This kind of job is the fastest way to make a quick buck. You basically apply to Amazon Turk program and you get assigned tasks. The money is not something to die for but at least you get your feet wet doing things online. 7. Fill up online surveys. Did you can even make money filling up online surveys?? How amazing is that! Websites like mysurvey and ipoll are some of the websites I found. The wonders of the internet are that you get paid, while making your opinion count.